THE POOR OF NEW YORK was written in 1857, while Boucicault was in the United States and desperately in need of money after the birth of his second child. Closely based on "Les Pauvres de Paris" (1856) by Edouard-Louis-Alexandre Brisbarre and Eugene Nus, it was a collaboration between Boucicault and three journalists, Seymour, Goodrich, and Warden - although the bulk of the writing was done by Boucicault - and was first advertised as being "by the **** Club". Popular with 19th century audiences, but derided by critics, it was a play which Boucicault himself admitted was "guano" rather than "poetry". 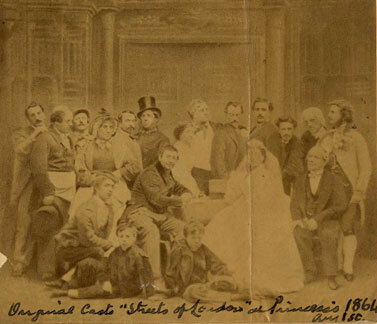 The Poor of New York was first performed at Wallack's Theatre, New York, in 1857. It was revived in 1864 in Liverpool, as THE POOR OF LIVERPOOL, and then frequently adapted to the location where it was to be performed, becoming THE POOR OF MANCHESTER or LEEDS, and then THE STREETS OF ISLINGTON, LONDON, or DUBLIN. The Poor of New York was initially set during the financial panics of 1837 and 1857, although the local and historical details were later frequently adapted to the places where the play was performed. It was the first of Boucicault's plays (like The Octoroon, or Jessie Brown) which tapped directly into the contemporary mood. The play also features a sensation scene, in which a house burns down on stage. In Act 1, Captain Fairweather decides to deposit his life's savings with the Banker Gideon Bloodgood (Crawley in some versions), not knowing that Bloodgood's bank is about to go bankrupt and Bloodgood himself planning to abscond. The money is accepted and he is given a receipt. At the same time, Bloodgood's clerk Badger is aware of his employer's plans and attempts to blackmail him. Bloodgood pays him off - intending to take Fairweather's money and run - when the Captain returns. He has heard that Bloodgood's bank is in peril and wants his money back. Bloodgood refuses and the Captain dies of an apoplectic fit. While Bloodgood triumphs, Badger pockets the receipt. Act 2, set twenty years later during another financial panic, shows us what has become of the Fairweather family. The Captain's wife, his son Paul, and his daughter Lucy are living in severely reduced circumstances, lodgers of the good-hearted, but likewise poor Puffy family. Paul has recently lost his job, and Lucy works at a millinery shop. Their friend, the aristocratic Mark Livingstone, who has a romantic interest in Lucy, has likewise become ruined. Meanwhile, Bloodgood has become one of the richest men in the city, lavishing his wealth on his daughter Alida, a spoilt, hard-hearted young woman. He is the Puffys' and the Fairweathers' landlord and presses them for the rent, which neither family can pay. In the third act, Livingstone appeals to Bloodgood, who is his creditor, for help. Alida, who, in spite of her wealth, has not been received into good society, seeks a well-connected husband. She gets her father to forgive the debt and lend Livingstone further funds, believing that she is buying herself a husband. Discovering that Mark and Lucy are in love, she persuades Lucy to give Mark up rather than see him ruined. Meanwhile, Badger has returned to blackmail Bloodgood for further money, but Bloodgood has him arrested. Act 4 sees the Fairweathers and Puffys fallen on even harder times. The Fairweathers live in a poor lodging house and are, in fact, Badger's neighbours. Both Mrs. Fairweather and Lucy, unknown to the other, resolve to commit suicide by smoke inhalation, but are rescued by Paul and Mark, just as Bloodgood has come to see Badger to get the receipt back off him. Badger tells Paul that Bloodgood robbed his father of the money, but faints before he can produce the receipt.